When I was at Berklee, one thing that took a while for me to really get my ear around was upper chord tones (7ths, 9ths, 11ths and 13ths). Growing up listening to a great deal of rock music – basic triads sounded “right” to me. I learned a lot of esoteric chord voicings to try to expand on those forms – but my ear wasn’t ready for it and so I had no real motivation to develop it at the time. As I mentioned in the getting through the gig and the recycling chords posts, simple triadic forms can be manipulated in a way that allows players to get more complex harmonic textures in real-time. Additionally, these approaches can be adapted to lead playing as well. This short series of posts are going to go deeper into adapting one specific chord voicing. As a starting point I’ll use the major triad. 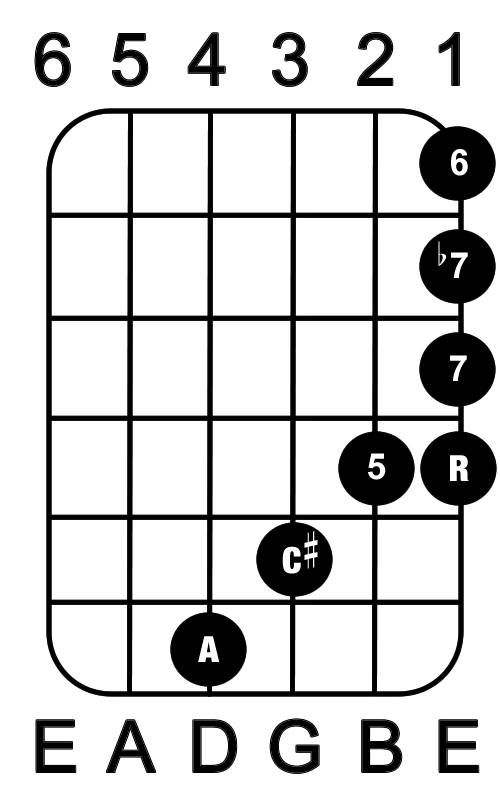 The following examples are based around a 5th position A major chord played on the D, G, B, and E strings. While notated this way for simplicity, all the examples are played with a slight arpeggiation to help accent the different notes. Here’s an mp3 of an A Major Triad. The first way to generate some additional substitutions for a simple major chord is to lower the root chromatically. While there is a root on both the D and the high E string, for now these examples will focus on manipulating the root on the high E string. Here’s an mp3 of this A Major 7 chord. 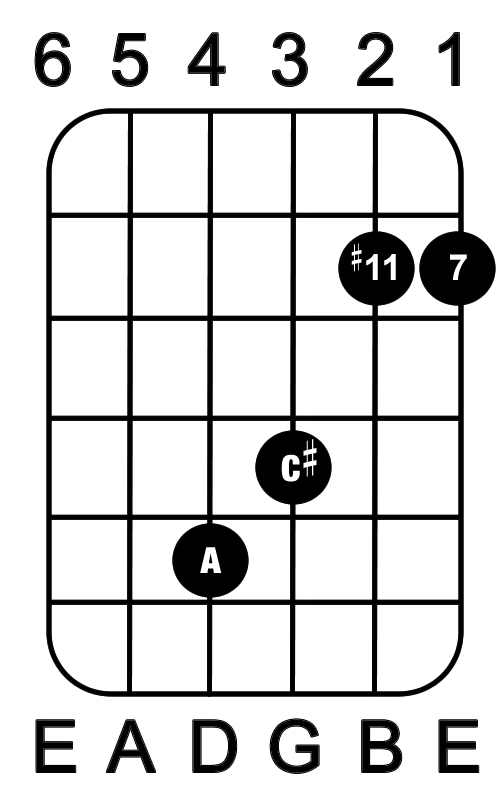 Here’s an mp3 of this A 7 chord. 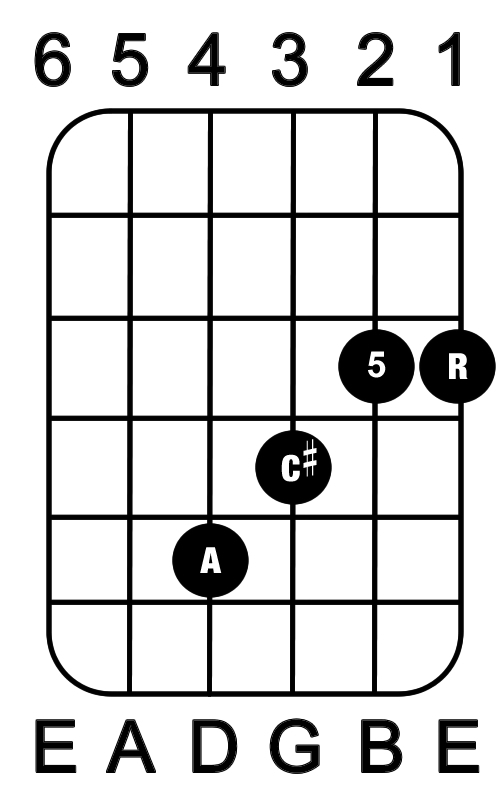 While dominant 7th chords contain a major triad in them – they are their own unique animal. A future post will go into generating dominant chords – in depth – but this voicing is presented here as part of the process of generating chords by altering the root. A Major 6 - Watch the 1st finger stretch - if it hurts - stop Immediately!! Here’s an mp3 of this A Major 6th chord. 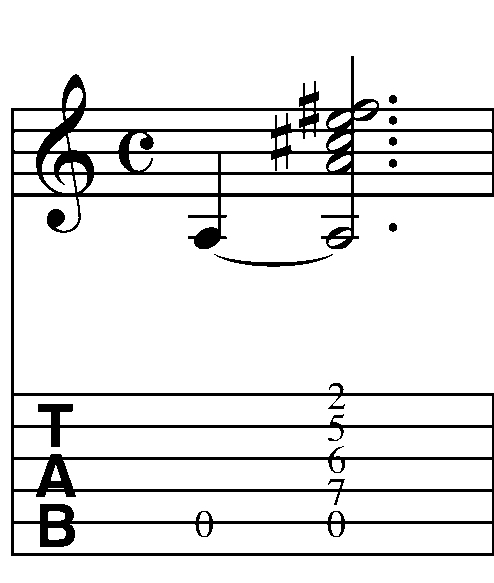 There are certainly easier ways to generate this chord – but any chord form with a 1/2 or whole step between notes on the B and E strings will require some limber hands. 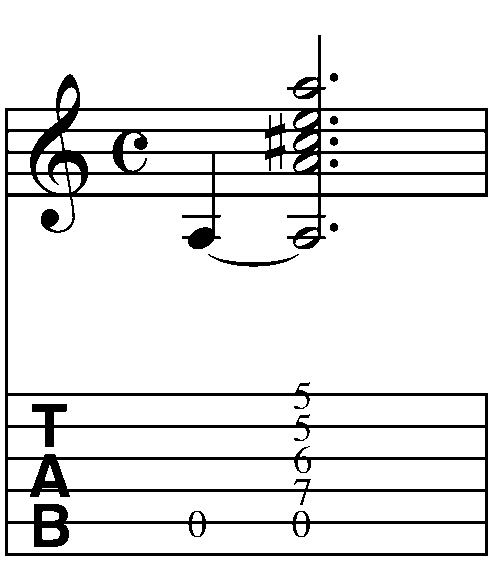 Again, this voicing is not the only possible voicing of this chord but instead is just one possibility. Frequently, I’m asked about the difference between a 6th chord and a 13th chord. 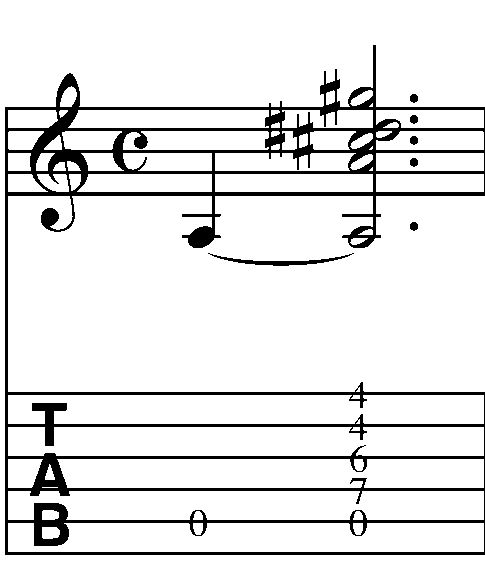 Since the note is the same for both the 6th and the 13th, the terms are sometimes used interchangably – but the difference is based around whether the chord has a 7th in it. In the example above, the F# acts as a 6th, because no 7th is present in the chord. 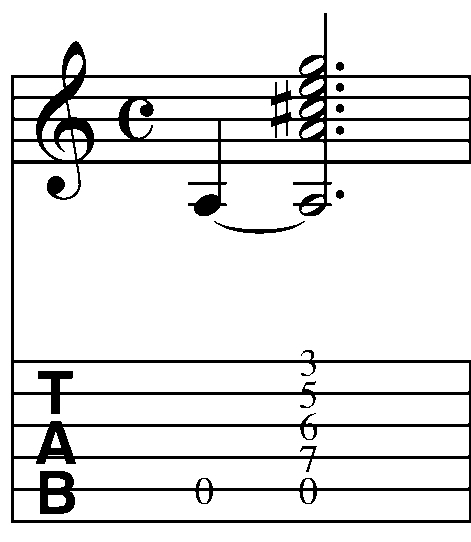 If a seventh was in the chord, the F# would be viewed as a 13th. One hip tone to use in a Major based chord is the #4 (or #11). This is generated by flatting the 5th a 1/2 step (1 fret). Here’s an mp3 of this A Major add #4 chord. I like voicings like this where the top voices (C#, D# and E in this case) are all close voiced (i.e. in the same octave). The technique of combining these close voiced ideas with open strings is a favorite approach of mine. This idea can be expanded on by flatting the root as well. This produces an A major 7 add #11 (no 5th) chord (A favorite substitution of mine for a major chord). Here’s an mp3 of this chord. 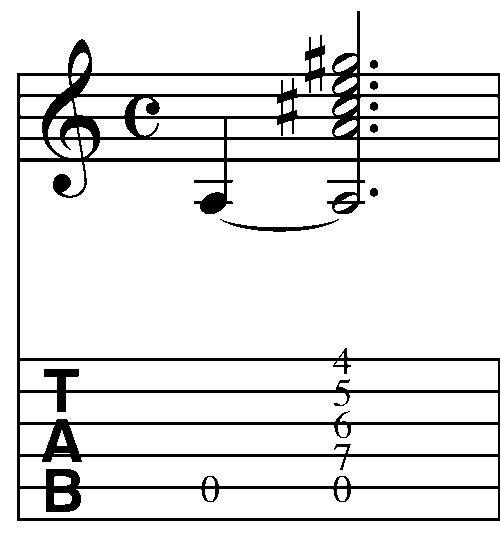 If you flat the top two notes of a major barre chord with the fifth and root on the B and high E string – you get a pretty hip major chord substitution. This works in any key. In part 2 of this series, I’ll look at sharping the 5th and the root to generate more chord voicings, combining both approaches and extrapolating lead ideas from these approaches as well. This entry was posted in Applied Theory, Lessons, Pedagogy, Uncategorized and tagged Applied Theory, chord short cuts, Chord Substitution, fretboard visualization, Getting through the gig, Guitar lessons, Guitar theory, Guitarchitecture, how to read chord symbols, Online Guitar Lesson, Scott Collins, triad substitution, upper structure triads by GuitArchitecture. Bookmark the permalink. Huge lover of your blog, your posts have seriously helped me out. Looking towards more posts! Well there are certainly easier ways to play it – but it is possible. The mp3 after it is me playing that specific chord voicing. The “trick” is to work on developing the stretch between the fret hand fingers. I do have a tip that may help. If you’re playing it on electric you could move the entire voicing up an octave where the frets are much closer together and then make an exercise out of it by switching from Major–>Major 7–>Dom 7–>A maj 6 (changing chords every beat or 2). You could then move the Major chord down the neck (into lower registers) chromatically until you get to the point where you can’t play the Maj6 voicing anymore. Then try to clean that one up. Once it’s clean try moving down another fret. If you work at it a little bit every day (and stop if there’s any pain) – you still might not get this specific stretch – but you’ll gain more flexibility in your stretches in general. This cluster approach is used a lot in positional (i.e. non open string) banjo-roll type licks. Some of them are very challenging – but can sound really cool. You won’t have “clean” classical style hand positioning – you may just be able to grab the top note with the very finger tip – but if the note sounds – and you don’t jack up your hand – it still counts! You could apply this approach to any type of chord change regimen that you want to develop. In part 2 – I’ll have a much simpler voicing for the chord (but wont have that cool top note cluster that this one does). On an easier route – you could always use a partial capo! that might work as well. Thanks for the great article! Easy to understand, yet an idea that evolves endlessly… after years of playing classical music, Im finally breaking through into improv, and tips like the ones in this article are excellent! Thanks a lot Paul! I’m glad it helps! !